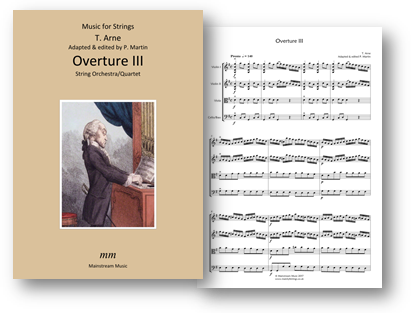 Arne's delightful and playable Overture III adapted for string orchestra. The repeats in the first movement are editorial. The smaller notes in the violin parts are included to facilitate less experienced players. The PDF contains a part for violin III doubling that of the viola. Click here to listen to a recording of the piece. Click on the image below to view the score.